I can expand out ~(C & B) into ~C OR ~B, and with the premise B, it is clear that ~C is the case. However, I'm having trouble proving this using a Fitch style system. I've tried disjunctive elimination, but I can't see how to get to ~C from an assumption of ~B, so I'm wondering whether or not this is the correct way to go. If anyone knows how to show the equivalent of a disjunctive syllogism in Fitch, or at least somewhere to find out how, some direction would be greatly appreciated. If you have a double negation rule, you can turn B into ~~B. Then you can use a disjunctive syllogism rule together with (~C v ~B) to get ~C. 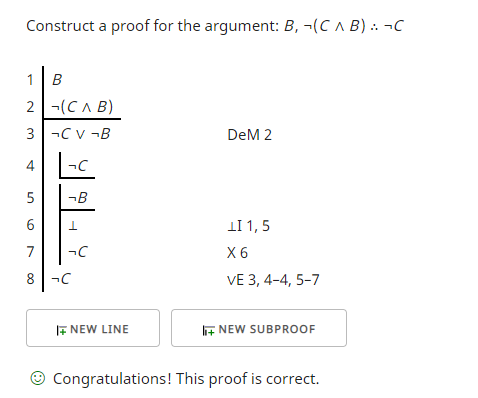 You can try an indirect proof, where you assume C, and then conjoin it with B to get (C & B), which yields a contradiction with line 2, entailing ~C. On line 3, I used DeMorgan rules (DeM) to get a disjunction which I will then need to eliminate to reach the goal. To eliminate the disjunction, I have to consider both disjuncts, "¬C" and "¬B". The first disjunct is the easiest, but it may be confusing because it is so easy. The assumption, "¬C", for that subproof is precisely what I want to show. There is nothing more to do (at least for this proof checker). The second disjunct uses explosion based on the observation that lines 1 and 5 are contradictory. This proof checker allows me to state the contradiction (⊥) on line 6 and use explosion (X) on line 7 to reach the conclusion that I want "¬C". The one you are using may require something different. Since I have the same conclusion for each disjunct I can discharge the two assumptions on lines 4 and 5 by citing the rule of disjunction elimination (∨E). In this proof checker I have to reference the disjunction itself (3), the first subproof (which is only line 4 but written as a range 4-4), and the second subproof (5-7).